The relationship between development aid and capital flows from Africa. ADDIS ABABA, 13 MAY 2018: Experts have called for combined forces to stem the illicit movement of money and capital from one country to another amid revelations that illicit financial flows from Africa were stifling the continent’s development progress. Dr. Nara Monkam, Research Director at the Africa Tax Administration Forum, shone a spotlight on the destination of funds and profile of those engaged in the transferring the money: ‘Some multi-national corporations employ tax evasion, trade mis-invoicing and abusive transfer pricing.’ According to the Director, inter-country cooperation at a continental level was required to tackle such practices. In addition, given that illicit financial flows from Africa involve actors from across the globe, and that the laws and policies of non-African jurisdictions have a serious impact on illicit flows from Africa, it has become a priority to review the adequacy of global frameworks in tackling illicit financial flows. Dr Monkam also added there was also a need for greater funding for technical assistance on tax matters and improvements in tax administrations. A call was also made to amplify advocacy for the return of illicit financial assets by Akingbolahan Adeniran, Rule of Law Advisor to the Vice President of Nigeria. He argued, ‘In the domestic setting, receiving a stolen asset is a crime. Why is receiving stolen asset from a victim country not a crime?’ In addition to the loss of finances for affected states, flows have a number of other negative effects, such as undermining governance, contributing to environmental degradation, skewing income distribution, deepening inequality, and exacerbating conflicts, particularly in resource-rich countries. The event also saw the launch of two ECA publications, A Study on the Global Governance Architecture for Combating Illicit Financial Flows and Base Erosion and Profit Shifting in Africa: Reforms to Facilitate Improved Taxation of Multinational Enterprises. During the event, Abdalla Hamdok thanked the Government of Norway for funding the ECA High Level Panel on Illicit Financial Flows from Africa chaired by former South African President Thabo Mbeki and noted the country stood out as an ‘extremely progressive partner’. 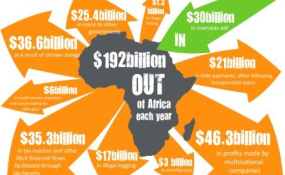 African countries have committed themselves to tackling these flows through target 16.4 of the UN Sustainable Development Goals and the 2015 Special Declaration of the Assembly of the African Union on Illicit Financial Flows.